Welcome Aboard a True Stealth Fighter! EL SEGUNDO, CA -- (MARKET WIRE) -- March 22, 2007 -- The newest addition to the Delta Wing series guitars, Gary Kramer Guitar is proud to announce the "F-1" guitar. The "F-1" guitar was named for the reason of having 1 pickup, 7 strings, and 36 frets. This "F-1" is a true wizard instrument that is not for the inexperienced. Seven-string guitars have been designed and constructed for years, while the vast majority of these instruments have inherited construction parameters from their six-string relatives. 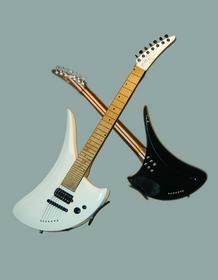 While designing the "F-1" guitar, the goal was to utilize a double-extended approach to the six-string guitars. As a result, we have created a completely new breed of seven-string monsters. The "F-1" features increased sonic range which stretches from low B, all the way to a 4th octave of high E. Taking the length of the "F-1"'s neck into consideration, it was imperative to be perfectly stable. Therefore, it was decided to construct the "F-1" using a five-piece lamination process. This design required only the best quality of well seasoned, quartersawn Wenge/Maple combinations. For increased playability the fingerboard utilizes two different fret sizes. Medium jumbo frets are installed from the 1st to the 24th fret position, with Vintage-sized wire running from the 24th to the 36th fret positions. Unlike other seven-string necks, the shape is the heart and soul of this instrument. You will be amazed by the "F-1"'s unique flat-neck profile which provides thundering amounts of sustain. As usual, our Delta Wing design approach allows for maximum ergonomics, perfect balance and easy access to the extended upper register. You can check out the "F-1" guitar at http://www.garykramerguitar.com. NOTE TO EDITORS: Photos and interviews are available upon request. Please call or email at 310-335-5248 or info@garykramerguitar.com. Gary Kramer Guitar Company is not related or affiliated with Gibson Musical Instruments of Nashville, Tennessee.